Nationality: American. Born: Laura Gainor in Philadelphia, Pennsylvania, 6 October 1906. Education: Attended public schools in Chicago and elsewhere; San Francisco Polytechnical High School, graduated 1923. Family: Married 1) the film producer Lydell Peck, 1929 (divorced 1933); 2) the costume designer Gilbert Adrian, 1939 (died 1959), son: Robin; 3) the producer Paul Gregory, 1964. Career: 1924—began acting as extra at Hal Roach Studio; then female leads in Peewee Holmes and Ben Corbin Westerns at Universal; 1926—contract with Fox; 1927—first film with Charles Farrell, Seventh Heaven (last film together in 1934); 1928—contract with Fox; 1939—retired following second marriage; 1951—with Charles Farrell, repeated role in Seventh Heaven on Lux Radio Theatre; 1950s—occasional TV appearances; 1959—stage debut in The Midnight Sun , Boston and Philadelphia. Awards: Best Actress Academy Award, for Seventh Heaven , Street Angel , and Sunrise , 1927/28. Died: In Palm Springs, California, 14 September 1984. "My Life—So Far—Told to Dorothy Spensley," in Photoplay (New York), December/January 1928–29. Billips, Connie J., Janet Gaynor: A Bio-Bibliography , New York, 1992. Parsons, Harriet, "Janet Goes to War," in Photoplay (New York), August 1930. Albert, Katherine, "Janet Is Back on the Job," in Photoplay (New York), November 1930. Burke, Randolph Carroll, "The Gentle Art of Janet Gaynor," in Pictures and Picturegoer , 8 August 1931. D'Arne, Wilson, "Janet Gaynor's Life Story," in Pictures and Picturegoer , 6–20 April 1935. Bailey, Kent, "A Star Is Born Again," in Photoplay (New York), July 1937. Carr, Chauncey L., "Janet Gaynor," in Films in Review (New York), October 1959. Roud, R., "People We Like: Janet Gaynor," in Film Comment (New York), January/February 1974. Obituary in Variety (New York), 19 September 1984. Nangle, J., obituary in Films in Review (New York), November 1984. Lambert, Gavin, "Janet Gaynor and Adrian: Nominee for A Star is Born and Her Costume Designer Husband," in Architectural Digest (Los Angeles), April 1992. "The Janet Gaynor Project," in Journal of Film Preservation (Brussels), November 1995. In Movies in the Age of Innocence , Edward Wagenknecht writes, "It would be hard to say whether Janet Gaynor is better remembered for her silent or her sound films, but her spirit was that of the silent years, and nobody could possibly have ended them more pleasantly." Gaynor did star for slightly longer in talkies than she did in silent features, but her characterizations were quite definitely formed during the earlier period; she was sweet and sentimental as only a silent ingenue could be, and was a perfect type for Depression-era audiences. She embodied cuteness, but it was never cloying or offensive. Perhaps appropriately, her last screen appearance (after many years of retirement) was in Bernardine , which starred the 1950s idea of cuteness in the form of Pat Boone. Gaynor's persona suggested the child-woman image which Mary Pickford had created, and, indeed, Janet Gaynor remade two of Pickford's silent features as talkies: Daddy Long Legs and Tess of the Storm Country . Yet Gaynor's characters were a little more sophisticated than Pickford's, a little more worldly-wise. As the director Victor Schertzinger once commented, "She has the maturity of the ages, and yet is singularly youthful." Under Murnau's direction in Sunrise , Gaynor is subdued, very much the German Hausfrau, with a blond wig complementing the harsh makeup she wears. This is perhaps the most untypical Gaynor performance in that Murnau gives the majority of the emotional scenes to her leading man, George O'Brien. The same is not true of Gaynor's films for Frank Borzage, Seventh Heaven and Street Angel , in which the actress is given free rein for her emotional outbursts. In Seventh Heaven she reaches the height of happiness in the symbolic wedding sequence with Charles Farrell, and the peak of angry emotion as she takes a whip to Gladys Brockwell, running her out of the home she and Farrell have created for themselves. Both Seventh Heaven and Street Angel illustrate the range of Gaynor's acting ability; in both she grows from a weak, frightened, disillusioned girl into a woman who knows love and experiences an inner strength. Another key Gaynor-Farrell teaming came in the touching and at times profound part-talkie melodrama, Lucky Star , which was rediscovered and theatrically rereleased in the early 1990s. She plays a poor drudge who loves Farrell, who has been paralyzed from the waist down during the war. Gaynor brings to the role a freshness, a hopeful quality in the face of adversity. Gaynor's first all-talkie, Sunny Side Up , is delightful for its songs—"If I Had a Talking Picture of You," "I'm a Dreamer," and the title number—but it is also embarrassing because of the babylike voices emanating from its stars, Gaynor and Farrell. That they were featured together in seven more films is extraordinary, but that Gaynor and Farrell managed to remain so overpoweringly popular is even more remarkable. 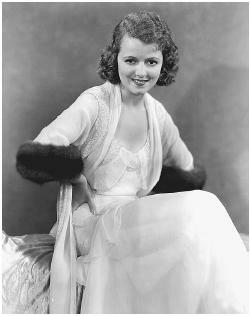 In fact, Janet Gaynor settled into a comfortable niche as a talkie star. Who else, for example, could have played Will Rogers's daughter in State Fair ? The actress's last great screen role was as Esther Blodgett in the first version of A Star Is Born , and it is curious that she should portray an actress reaching the pinnacle of her fame just as her own career was reaching its end.